After cruising over 2700 nautical miles around SE Alaska and taking a side trip up to the interior to see Denali, we finally got the chance to spend a little time in the town of Petersburg (aka “Little Norway”) where we’ll settle for the winter months. We’ve been looking forward to exploring more of our new “back yard” and meeting people, and we were lucky to be in town for the Rainforest Festival. 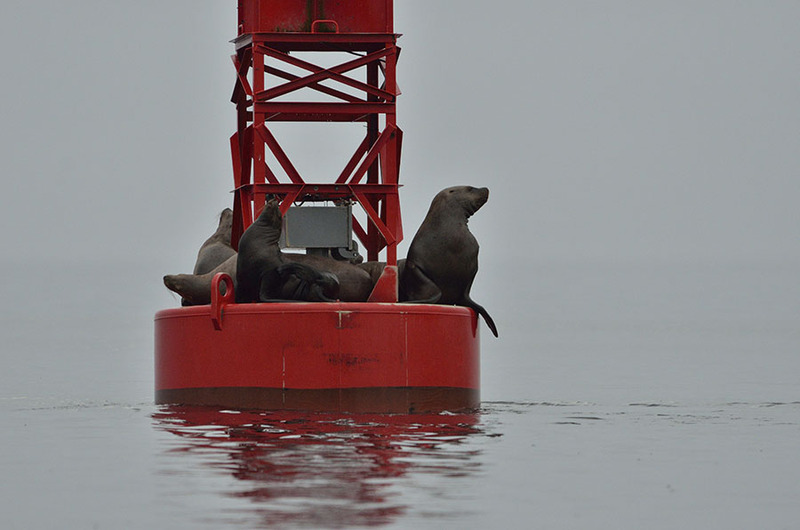 A marine mammal expert from Kodiak was on hand to give a talk about Steller sea lions – appropriate since we have a healthy population in the area, and a few that always hang around in the harbor. Stellers are much larger than their cousins, the California sea lions, and the Steller males can weigh up to 2000 lbs. Kate, a professor from the University of Alaska, gave an excellent talk about these animals, and relayed a number of great stories. Suffice it to say that neither one of us is inclined to go diving in the harbor since the sea lions love to harass divers. 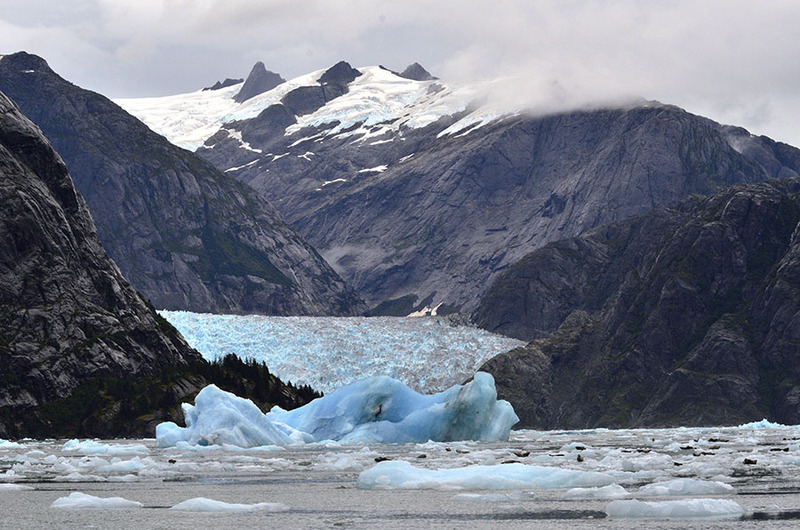 In addition to the lecture, the Festival organized a boat trip to see the Le Conte glacier – Petersburg’s “local” glacier and one of the reasons the town was originally founded here. In the late 1800s it was very difficult to keep fish fresh to get it to market down in Seattle, but the ready supply of glacier ice solved the problem nicely and the town flourished. 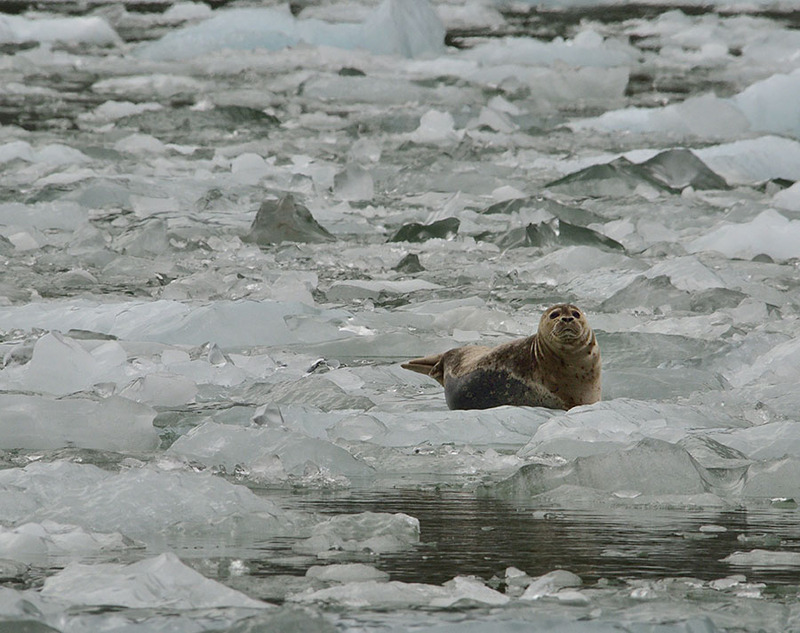 The boat tour included commentary by Professor Kate so it was a rare treat to learn more about the marine mammals near the glacier – particularly the seals. The Le Conte is a difficult glacier to see since the approach has a lot of twists and turns, and it’s often choked with brash ice and bergy bits. There is no way we could have gotten ADVENTURES in close to see the Le Conte, but the nimble jet-drive aluminum tour boat was perfect for the job. Of course the day of the tour was foggy and it was raining hard, but since the tourist season was over and the participants were all locals, no one thought anything about the weather. We all just dressed in our rain gear and boots, and I brought “rain coats” for my cameras. 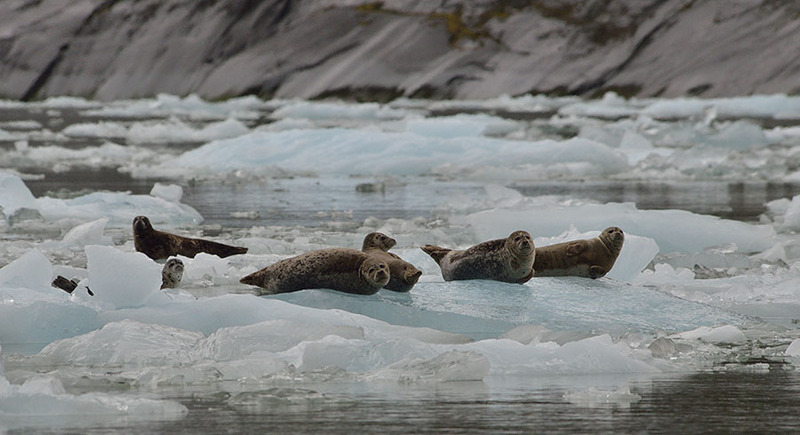 There were lots of seals around the glacier and we enjoyed learning more about them. 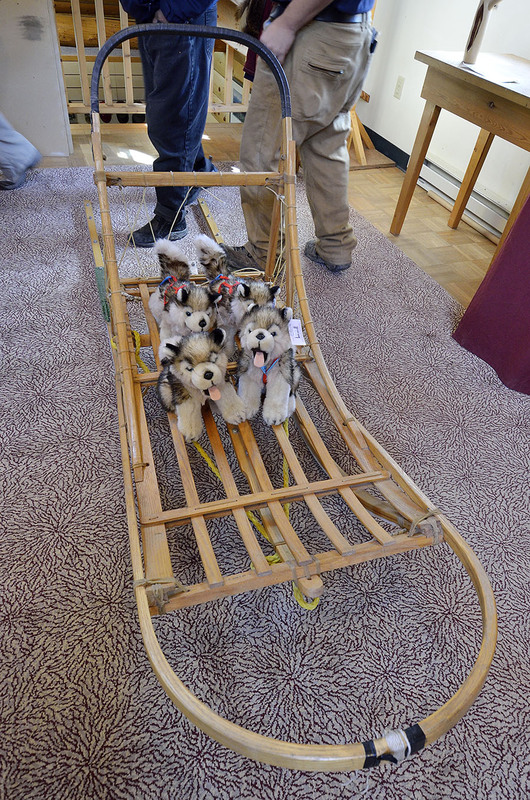 They prefer the ice over any other terrain to haul out on, and they even give birth to their pups on the ice. 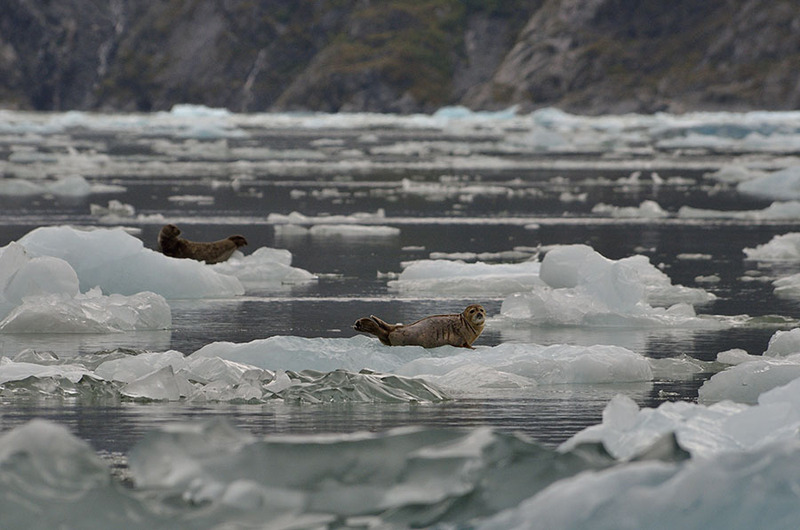 Here you can see the Le Conte glacier, and if you look closely you’ll see lots of little brown seals in front of the snout. 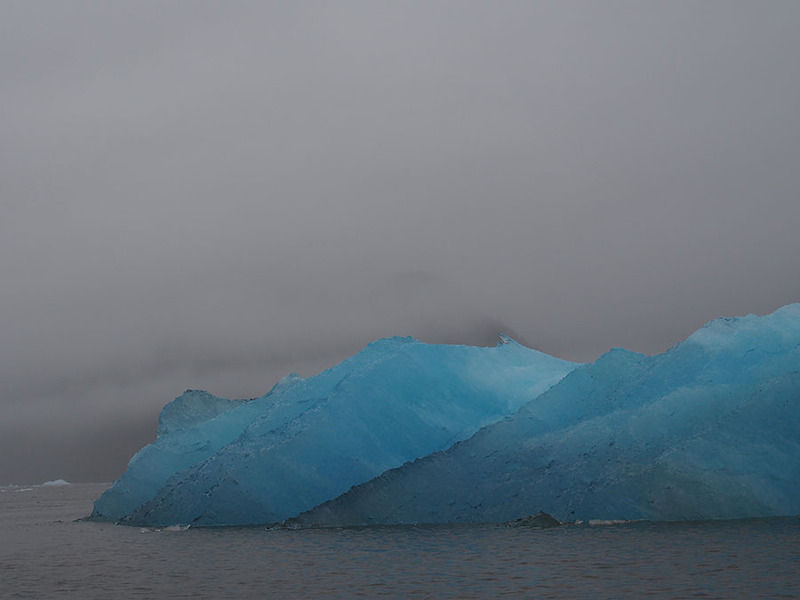 The ice is so magical – it can have so many different colors, and I love the almost fake-looking turquoise blue that’s common in glacier ice. Some ice is perfectly clear, some is white, and some is black from the grit and rock ground from the mountains as the glacier makes its way down to the sea. The shapes and sizes boggle the mind, and I don’t get tired of looking at all the different formations. 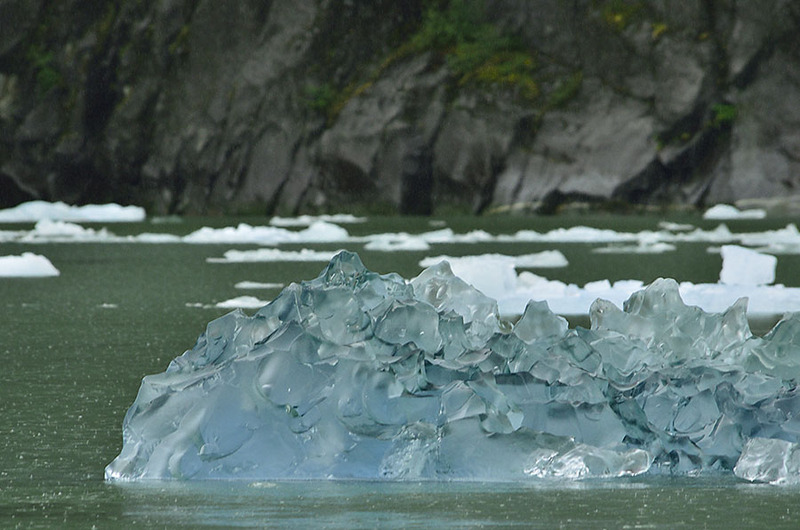 You just have to be careful about getting too close to the bergy bits since pieces sometimes calve off, changing the center of balance and causing the ice to roll over or pop up. As we headed back towards Petersburg the clouds got darker and some of the big bergy bits really stood out against the gray sky. Who says a rainy day can’t be a beautiful thing? 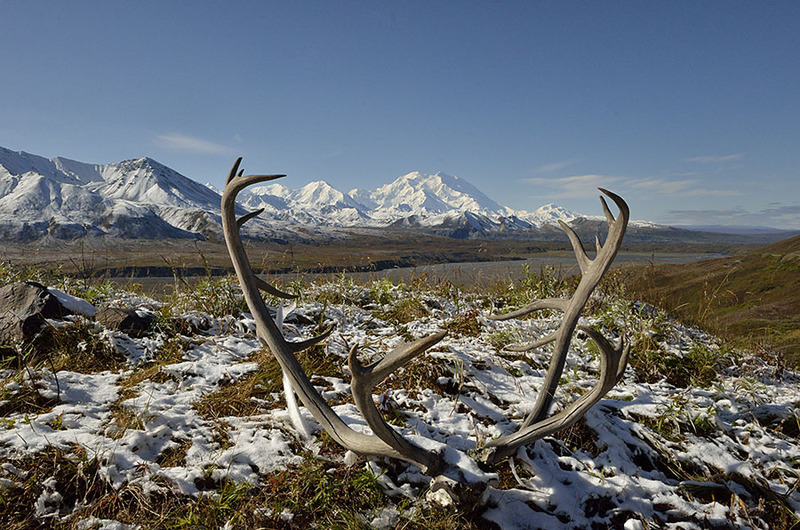 147 years ago the U.S. purchased Alaska from Russia for the price of $7.2 million dollars, and the formal transfer took place at Fort Sitka on this day. Happy Alaska Day! It only took 92 years after that for Alaska to become the 49th state, proving that glaciers aren’t the only things that move very slowly. 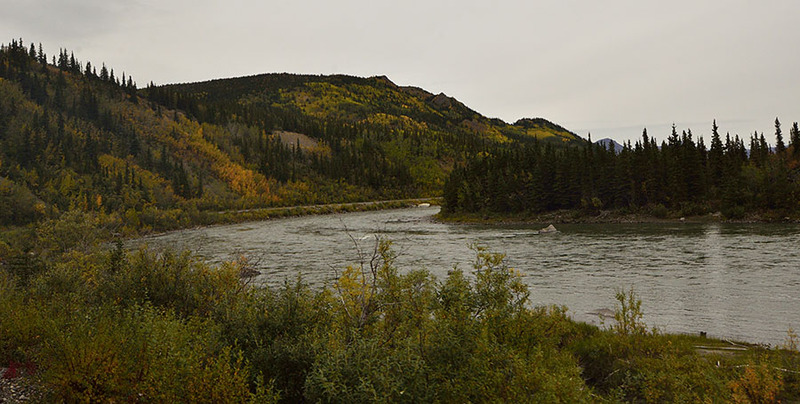 The last post talked about our terrific too-short two days in Denali National Park, and this post will wrap up the last bit of our week long side trip to see different parts of Alaska. It was strange to see so much fall color in the first few days of September, but fall is a very short season in the interior. “So much fall color” is relative since the majority of the trees are evergreens rather than deciduous. 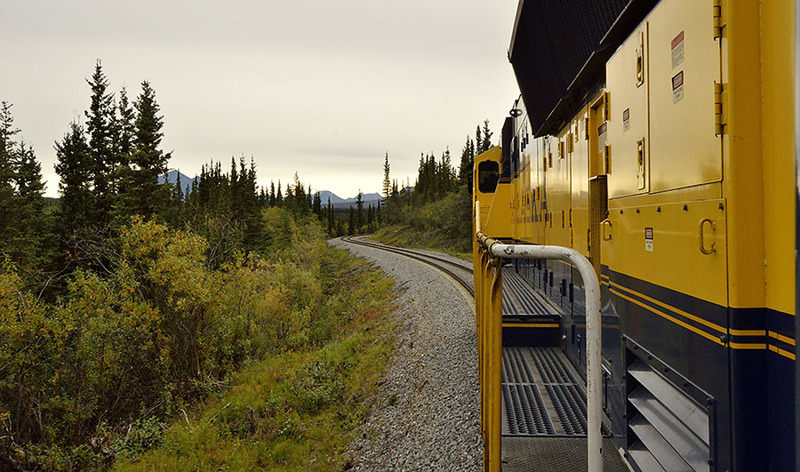 We took the Alaska Railroad from Denali back down to Anchorage in a “dome car” with panoramic views from every seat. The train runs at a slower speed – the whole point is to enjoy the ride, and it’s fantastic that the train stops for wildlife sightings. We spotted a moose cow and calf in a field, and the train not only stopped but it actually backed up to give all the cars a better view. We loved the Alaska Railroad, but we discovered that some trains have dome cars provided by the Alaska RR, and some trains have cars provided by the cruise lines. We definitely prefer the Alaska RR cars – the commentary was excellent and informative; the cruise ship version was more “rah rah”, pushing fancy drinks from the bar and mindless “entertainment” more than actual information. We’ll be more careful when making arrangements in the future. 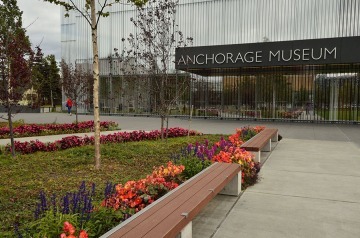 We took an extra day to explore Anchorage – Alaska’s largest city in terms of population – about 300,000. We wanted to learn more about the infamous 1964 Good Friday earthquake, the second most powerful earthquake ever recorded at 9.2 on the Richter Scale. The devastation in the city was tremendous, though there was also significant damage and impact for 200 miles around. In areas to the south the ground fell, while an area near Kodiak Island was permanently raised about 30′, and the port of Valdez was destroyed by an underwater landslide. Tsunamis from this quake impacted Hawaii and Japan, as well as local towns. It’s a reminder that Alaska is a geologically active place, and although we haven’t actually felt any earthquakes this summer we did experience one when we were in Haines. The people in town felt the overnight rumbling, but since we float we didn’t notice until the next morning when our cell phones stopped working. The quake was centered about 100 miles to the west, and it severed a fiber optic communications cable that serves the northern part of Juneau, Haines and Skagway. It’s a good thing we’re immune to tsunamis down here in Petersburg! We heard good things about the Anchorage Museum so we set aside some hours to explore it. 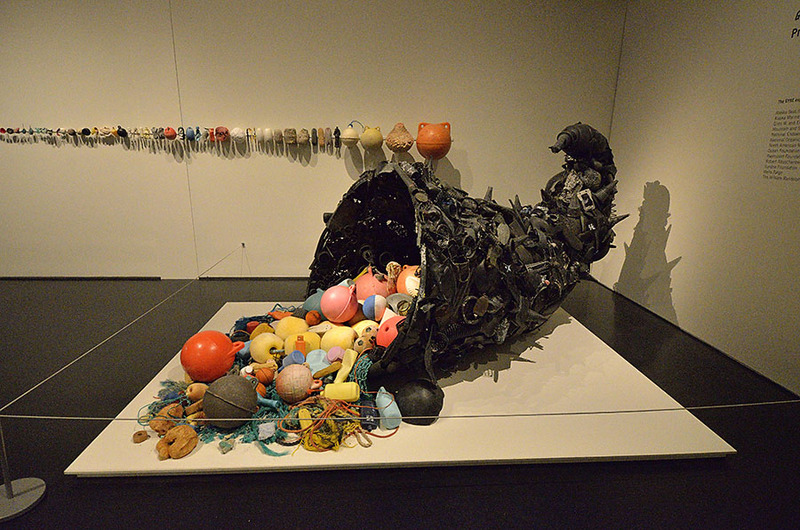 The museum was currently hosting an exhibit called “Gyre” about the horrific problem of plastic trash in our oceans. It was a very compelling exhibit, telling the heartbreaking story of humanity’s carelessness and callousness in very innovative and even beautiful ways. We wallowed in native culture, amazed at the variety of creations from all the different tribes, particularly those in the northern and interior regions. In British Columbia and SE Alaska we only see things from the Tlingit, Haida, and Tsimshian tribes so we appreciated their extensive collection. 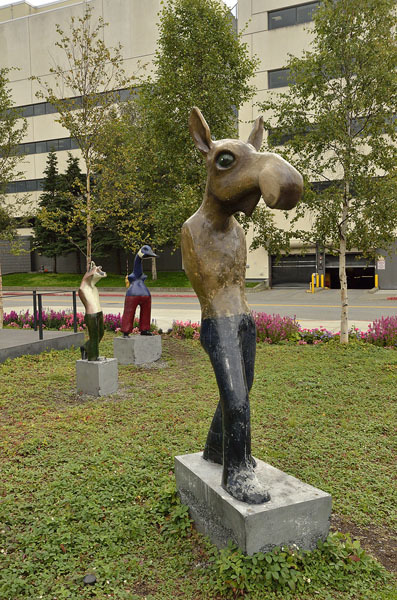 The museum also had an exhibit of Art of the North in a variety of media – most excellent. My favorite was a small set of photographs about the Kobuk Valley National Park – an arctic desert 25 miles north of the Arctic Circle. I love that kind of stark, dramatic landscape and now I have to figure out how to visit such an inaccessible place! 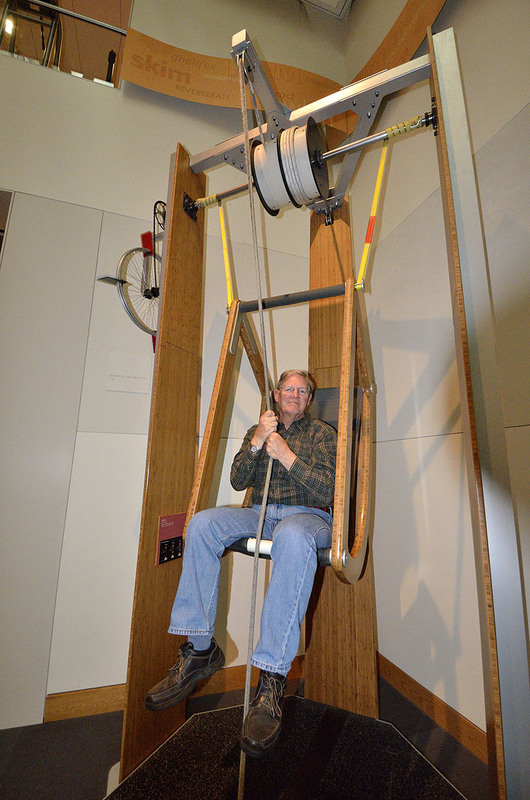 We discovered the Imaginarium on the lower level, unfortunately a little too close to closing time, but we still managed to find some neat science-y things to play with. You’re never too old to have a happy childhood. 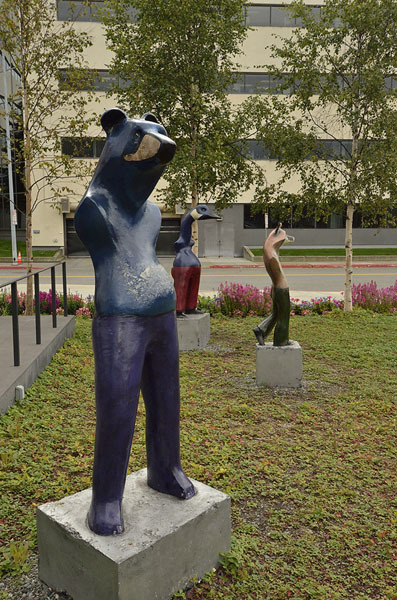 To wrap it all up, we got a kick out of the funky statues just outside of the museum – art meets local wildlife. 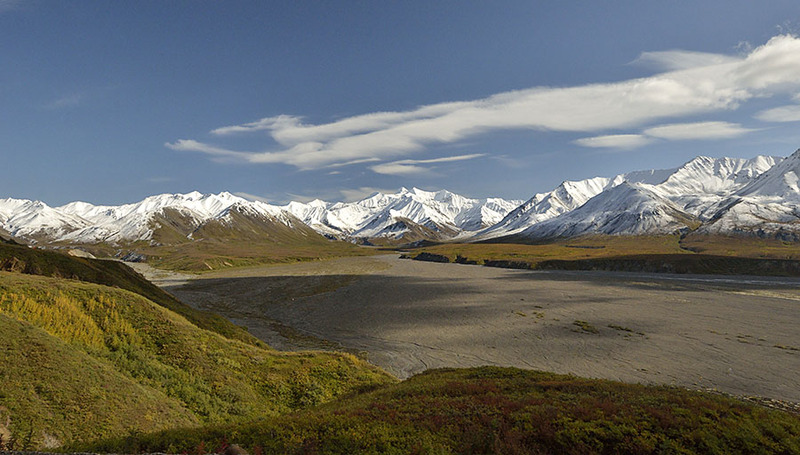 Our first day exploring Denali National Park involved a 5am wake up and 184 miles on a dirt-gravel road in a school bus – it was outstanding and we just loved it! In fact, the only problem was some extreme frustration because there were so many places we wanted to stop and savor the landscape or to get a better view of some wildlife along the way. We didn’t get back to our hotel until about 8pm so we put the camera batteries on chargers, grabbed a quick bite of dinner, and fell into bed so we could do it all over again. 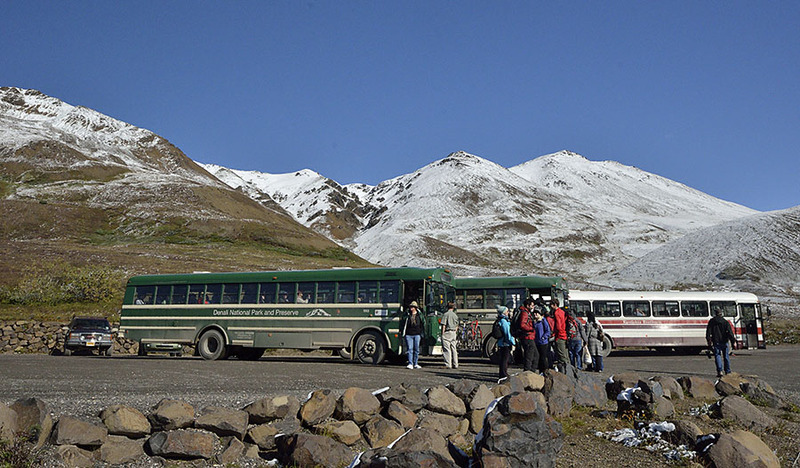 Our second day in Denali was a bit less structured – we decided to take one of the park buses up to Mile 66 – to the Eielson Visitor Center so we could spend some time hiking. We still had to get up at 5am in order to catch a park bus that would get us to Eielson early enough to have plenty of time for hiking, and we arranged for box lunches from our hotel since there isn’t anything available inside the park. 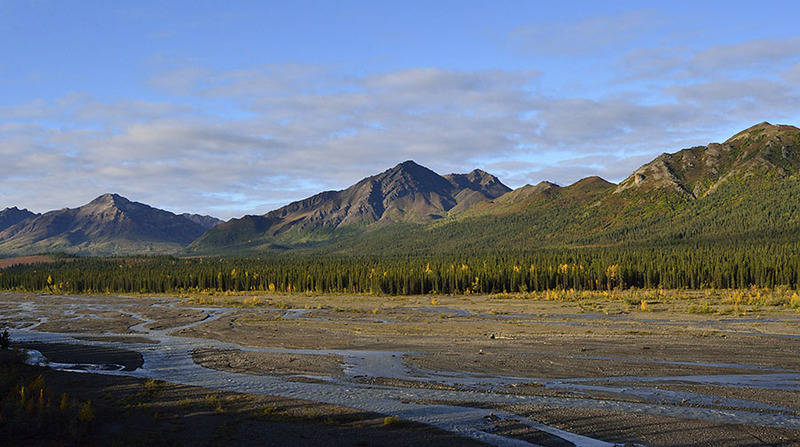 An interesting feature of Denali is that there aren’t that many actual hiking trails – rather the park is just open wilderness and you can hike anywhere. Along the first few miles of the park road there were temporary signs closing that area to hiking because it was moose mating season. 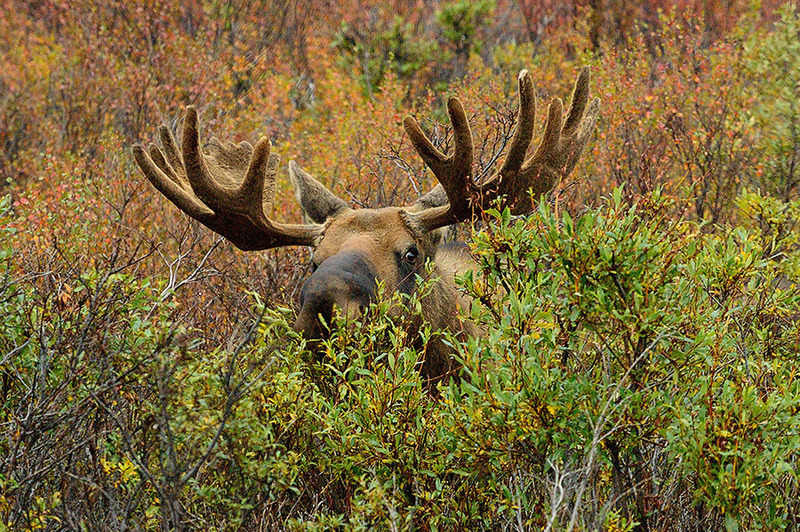 Moose are grumpy and dangerous enough on a good day; I hate to think of how much worse they can be when they’re rutting. But the good news is that we saw a number of moose… …and one was very close to the edge of the road. (I wonder how thick the steel is on a school bus?) We were most excited about the moose, caribou and Dall sheep since they aren’t things we see down in SE Alaska very often. We saw a number of brown bears, though they are called “grizzlies” in the interior and they are smaller than the coastal brown bears that we’re used to because they don’t have all that salmon in their diet. 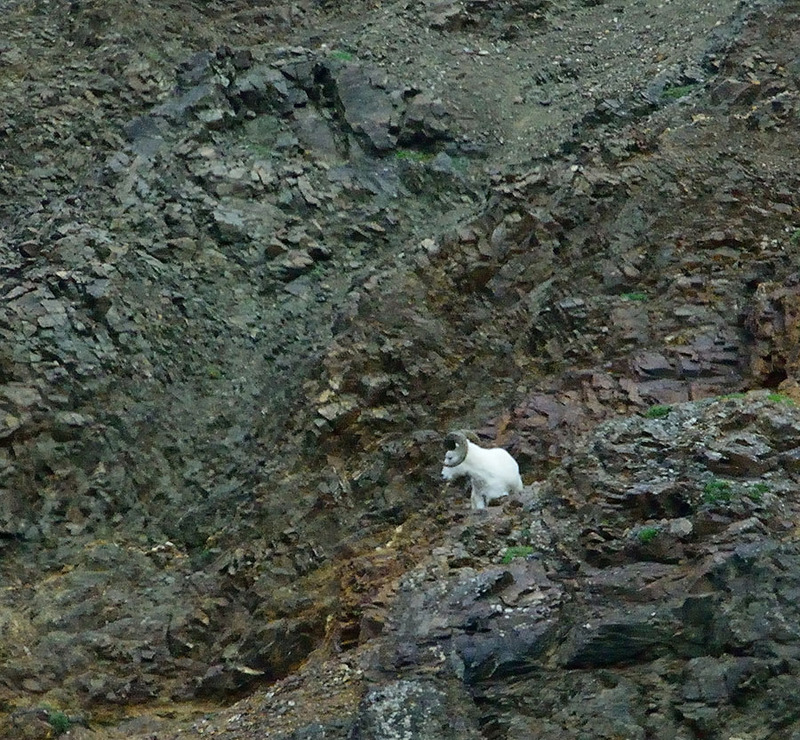 We saw a number of Dall sheep up on the mountainsides, though they were usually too far away for good photographs. This ram came down a bit lower so we could get a better view. Sometimes it’s hard to decide whether to just look at them with powerful binoculars or try to get a photograph, hand-holding a long lens. Regardless, any wildlife sighting is a thrill. 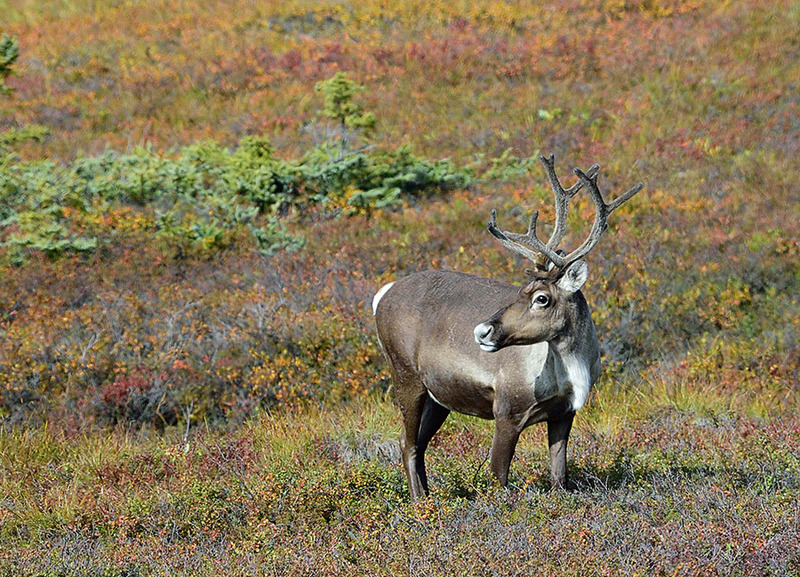 We had a number of caribou sightings, and they are impressive with their huge antlers. 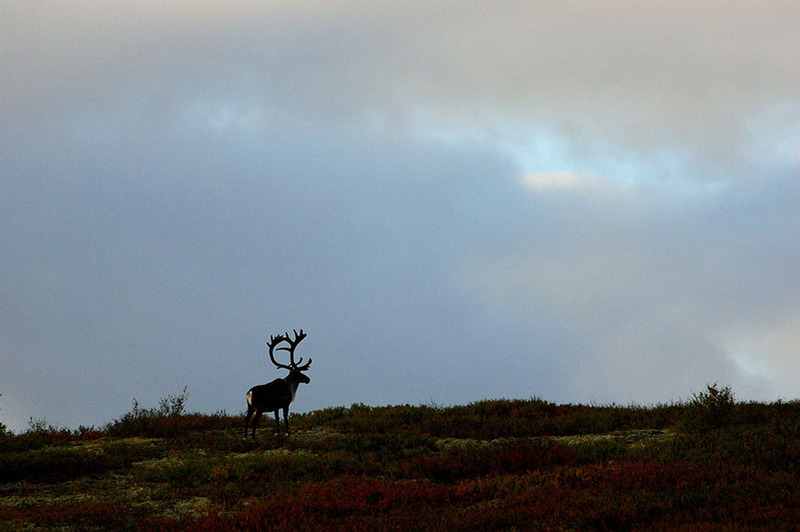 One caribou even ran across the road in front of our bus! My favorite was this one, though, silhouetted against the late afternoon sky. He’s a beauty! 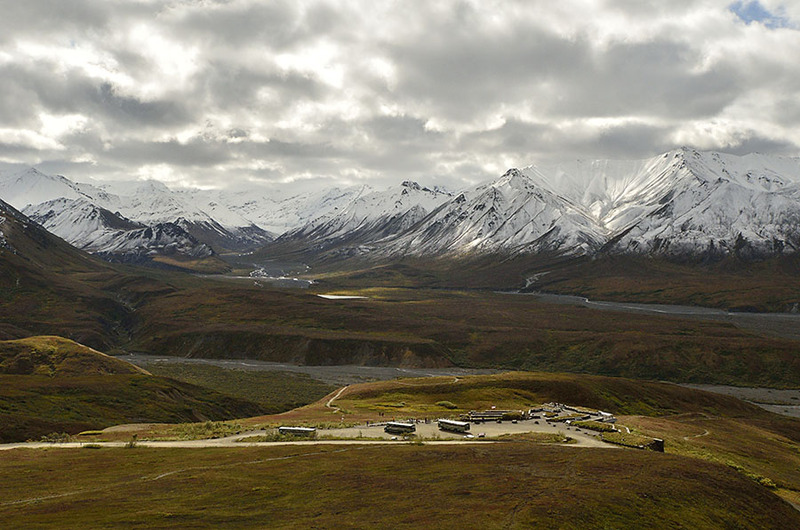 We finally got to the Eielson Visitor Center and began to appreciate the views we had the day before. Our second day was overcast which made the chilly temps feel much colder, and we never saw the mountain (THE mountain) all day. 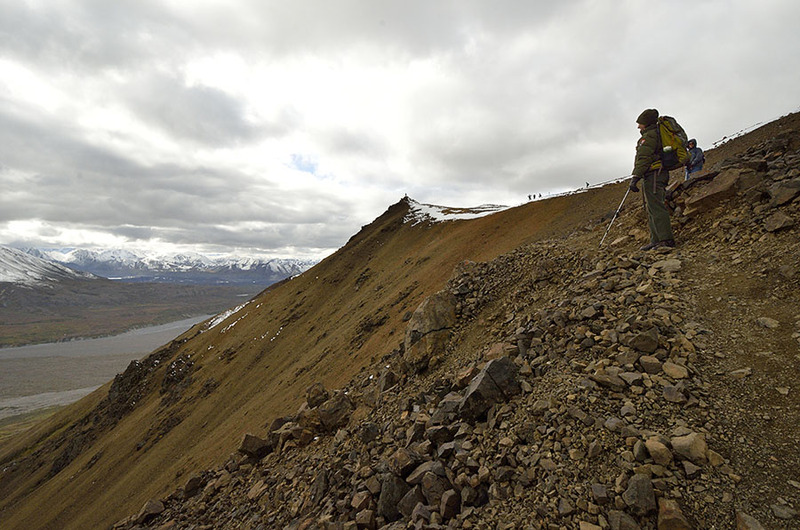 We decided to hike up the Alpine Trail behind the center, through the high tundra. It wasn’t a very long hike but it was very steep, climbing over 1000′ feet on a mile-long trail. 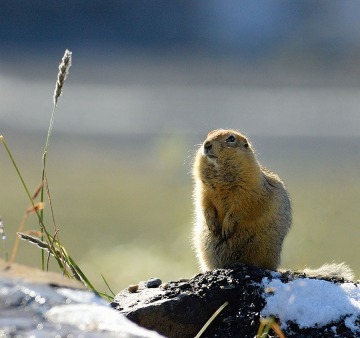 We stopped often to catch our breath, but we were lucky enough to hear and then see some little pika – 6″ long mouse-like animals that live in the rocky high country. They don’t hibernate, so they were very busy gathering food to get them through the long winter. The tundra seems plain and barren, but there was a lot of subtle fall color in the various plants and the lichens growing on the rocks. The views along the trail were grand sweeping landscapes, though they would have been even better if we could have seen the mountain from up there. As we got higher up the mountain the wind really made us feel the cold, and we were glad we brought some layers of clothing, warm hats, and gloves. 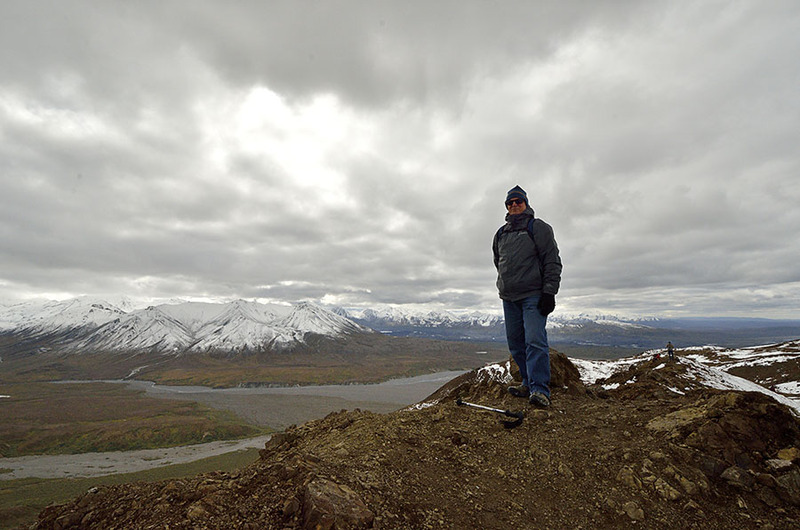 It was very strange to be standing on snow on August 31st, but that’s Denali. As of today, the park road is completely closed due to snow, only accessible by dog sled until spring. After the flight to see the Alaska Range of mountains and Denali (Mt. McKinley) we headed to Denali National Park for two too-short days of exploration. 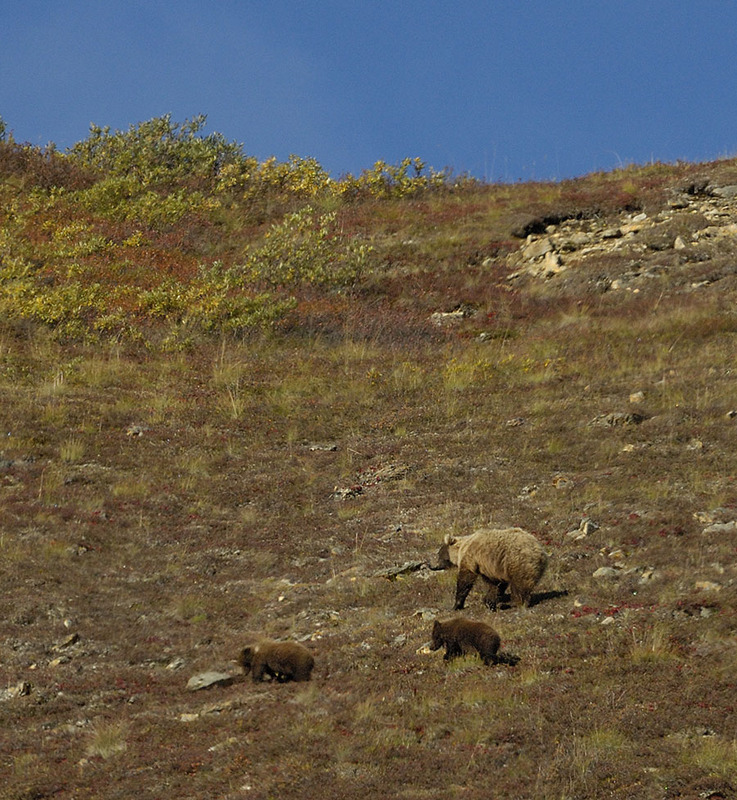 I apologize that the blog is so far behind, but note that we were in Denali in the last days of August. Summer, right? No – we were lucky enough to catch the short fall season which only lasts for a few weeks. Note the light dusting of snow on the mountains in the background – it was pretty chilly, with temps dipping into the high 30s overnight but the autumn color was well worth it. You have to set your alarm clocks for an early (5 am) wake-up if you want to really see Denali National Park. The 6 million acre park is difficult to explore since there’s only one road into the wilderness, 92 miles long. The first 15 miles are paved and open to private vehicles, and beyond that the road is dirt/gravel and only open to the park’s Blue Bird (school) buses. 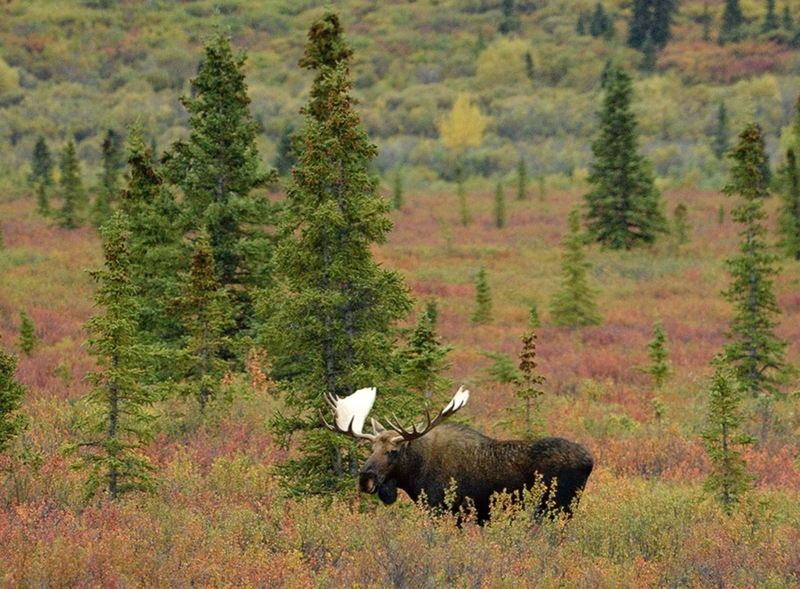 The buses will stop for wildlife sightings, but you can’t get off the bus for those stops. We had to do a lot of jumping up and down to wrestle with the sticky school bus windows to get photographs or video, and it was a bit frustrating. On the first day we took a tour that traveled the entire 92 miles of the park road to the Kantishna Road house, and we were incredibly lucky to have glorious weather. 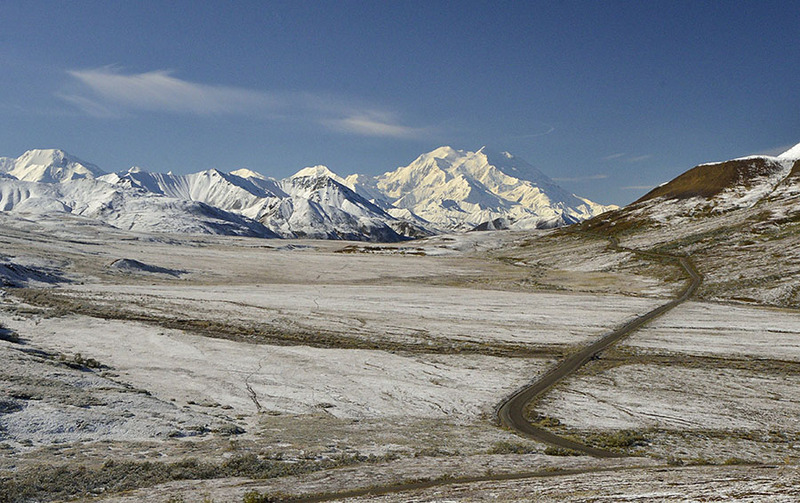 It was chilly, but very clear and we had perfect views of Denali (THE mountain) all day long. We didn’t realize how rare it is to be able to see the mountain from the park – only 30% of the visitors get to see any of the mountain, and even then it is often partially obscured by clouds. Less than 10% of the park’s visitors get the kind of view we had, which was just awesome. 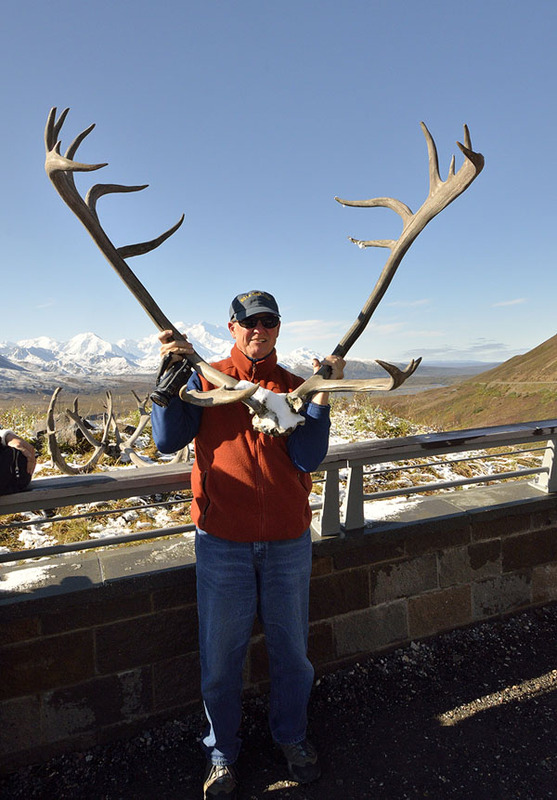 Here’s Denali framed by some caribou antlers at the Eielson Visitor Center at mile 66… And Jim showing us how big and very heavy those antlers are! I wanted him to hold them on top of his head but they were just too ungainly. 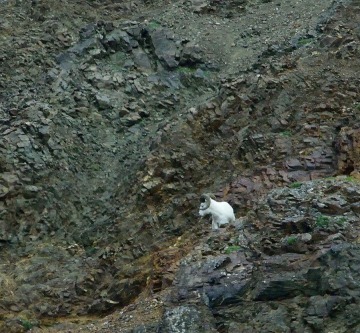 We had some great wildlife sightings along the way – moose, caribou, bears, and Dall sheep, but I’ll save most of them for tomorrow’s Part 2 posting. We had fun watching the little arctic ground squirrels, though the ones near the visitor center were pretty plucky, looking for food in anyone’s bag left on the ground. After a number of wildlife sightings and some stops where we could get out and stretch our legs we finally got to the end of the park road at mile 92. 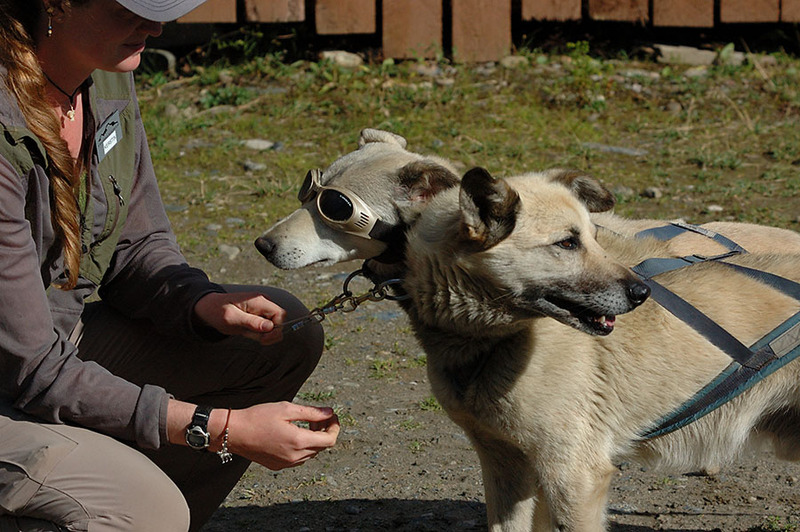 We left our hotel around 6:30 am and arrived at the Kantishna Roadhouse around 1pm. The talk was illustrated with a real sled and some little stuffed dog toys as we learned about lead dogs and wheel dogs, and the demonstration used just 6 dogs (where an Iditarod team might have 16) to show us a little of how it’s done. The dogs were so happy to run, and they are obviously very well cared for. We were glad we chose to go the entire distance into the park on the first day so we could figure out how to make the best use of our time on the second day. It was a long ride back out the park road, and we spotted places to go hiking, looked at wildlife, and enjoyed those Denali views all the way. 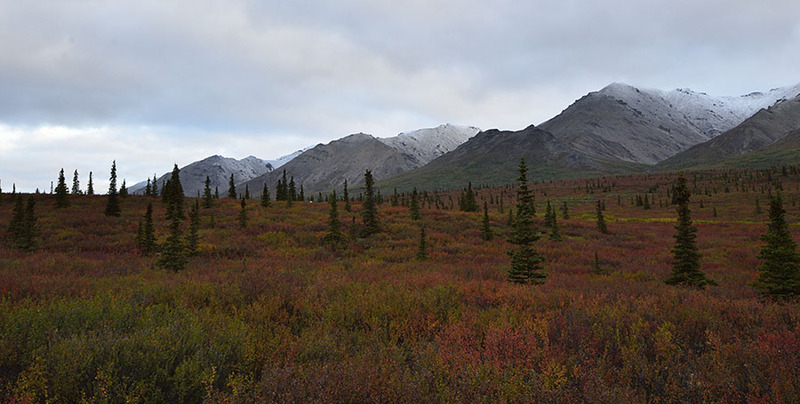 The fall color and the snow were quite unexpected, and the rangers at the Eielson Visitor Center told us that they’ve had snow in every month this year. 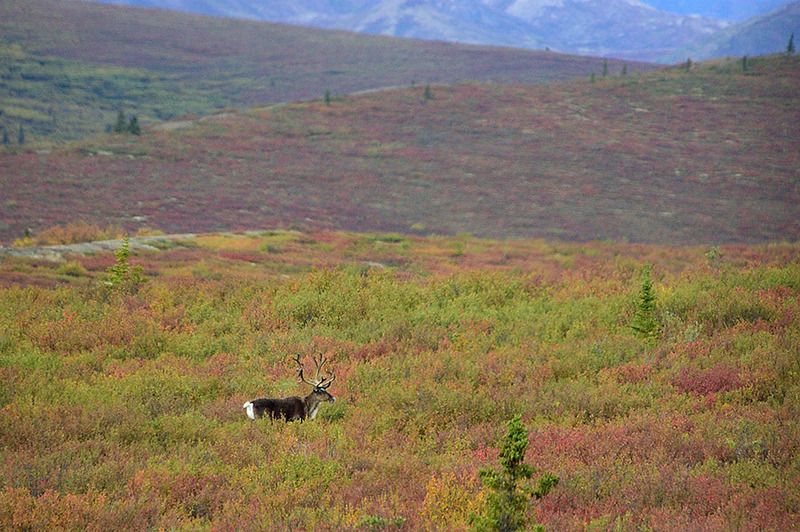 Denali (the park) was very overwhelming – so much wildlife and such stunning landscapes. The color in the alpine tundra was so pretty, especially set against the snow covered mountains of the Alaska Range. We’ve already realized that two days isn’t enough time to explore and savor here.